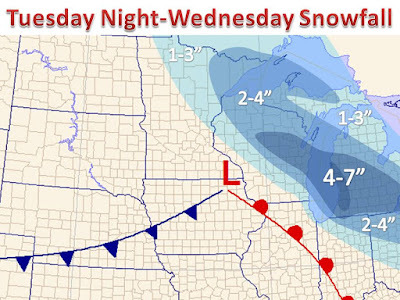 An area of low pressure will dive into the northern Plains overnight and quickly develop through the morning on Wednesday. A narrow band of moderate snow is expected to set-up to the northeast of the track, across the Upper Great Lakes. Models are coming together in placing this band from northeast Wisconsin into Lower Michigan. It will be one of those cases where some may see nearly nothing and 50 miles north they see 6" of snow. The snow is expected to be of the light a fluffy variety, so it will quickly pile up Wednesday. The narrow band of snow should produce a general 4-7" of snow, with 7"+ expected in western Lower Michigan where some lake enhancement is expected by tomorrow. Total snow forecast is attached above, along with one model's take on the what the radar may look like tomorrow, attached below. Winds during the snowfall should be rather light, but as the low pressure system pulls away Wednesday evening, winds will shift to the north and increase with time during the evening and early part of the overnight. Gusts of 25-30 mph are then possible, which could act to blow the light and fluffy snow around through Thursday morning. Be sure to 'like' us on Facebook and follow on Twitter for more weather updates!